Whatever Happened 2 Bay B Kane? : Guess who's back? My sites got hacked - all of them. Serves me right for having a weak FTP password. So here I am - back with lovely old Booger - I mean Blogger. 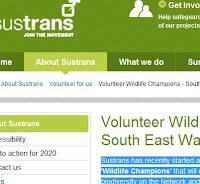 "Sustrans has recently started an exciting new project in Wales called 'Wildlife Champions' that will enable us to audit, preserve and promote biodiversity on the Network and also to involve new groups of people in understanding the natural world around them. Wildlife Champions monitor wildlife and conduct biodiversity audits on a selected section of the Network. This enables Sustrans to record, improve and promote the diversity of wildlife on walking and cycling routes."